family art is something that I have to work hard at. In the end, I'm usually glad that I put in the effort. I am not a fan of messes that I don't make myself and so I have to focus on the fact that it's a family creative initiative and it WILL be messy. If I prepare myself ahead of a time for that reality then it helps me not to mind too much. This summer we did more family art projects than ever. Sun painting was the first art project we tried. I saved this for our camping trip so that we'd have something fun to look forward to (I'm not a great camper and this helped me to have something to look forward to). 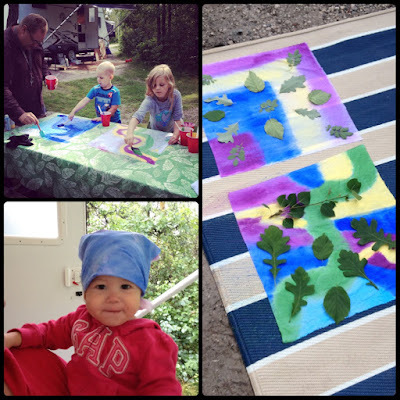 The idea is that you paint the fabric with diluted paint, then place leaves etc on it, lay it in the sun to dry. We followed this tutorial here. We didn't have much direct sunlight that day, so only a couple turned out the way we had hoped, but they were all colourful and we had fun doing it. Tree faces is a family favourite and we've already decided that this will be an annual summer tradition. Tutorial/instructions can be found here. Stick painting might have been one of my favourites. 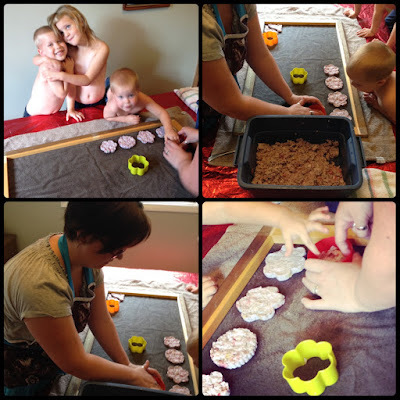 (I chose family crafts that I wanted to try and it helped to keep my focus off the mess and onto the creative effort). 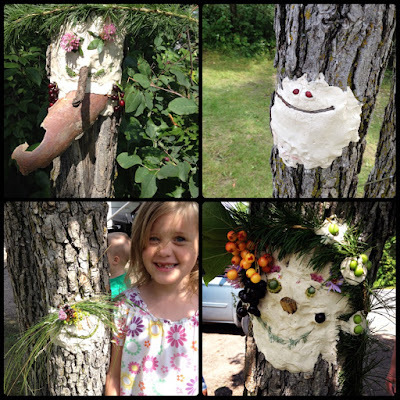 We had some grumpy-ness during this craft and it was uncomfortably hot, but I loved the results and still have them in a vase in my kitchen. Paper making was a two day process and the results weren't as satisfying with this method, but I think the children had fun with the process, so I can still feel like it was a success. Tutorial that we used is here. Bubble painting was another children favourite. The picture above of them blowing the bubbles is before we got the paint to water and soap ratio quite right. The littles were less interested in the art than the bubble blowing, but I got some cute stationary out of the deal. Tutorial/idea from here. 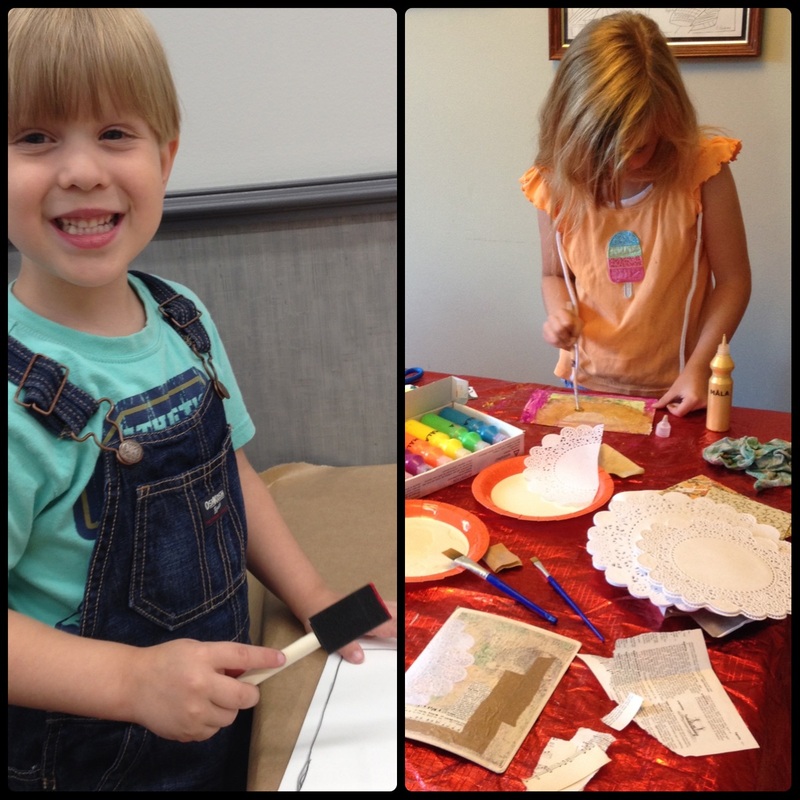 Individual craft time can also reduce the mess. 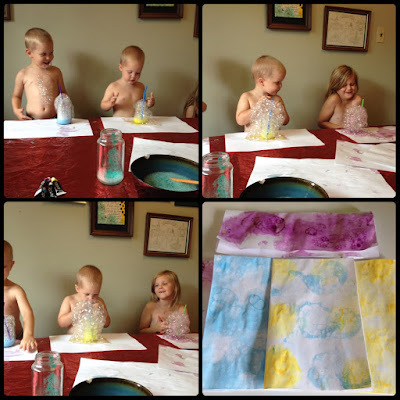 Malachi did a cute printing paint project (similar to this method) at Michael's and the mess stayed at the store - worth the $2! Abby and I had a mini art date one quiet time and we did make a large mess, but with it just being the two of us it was still manageable. 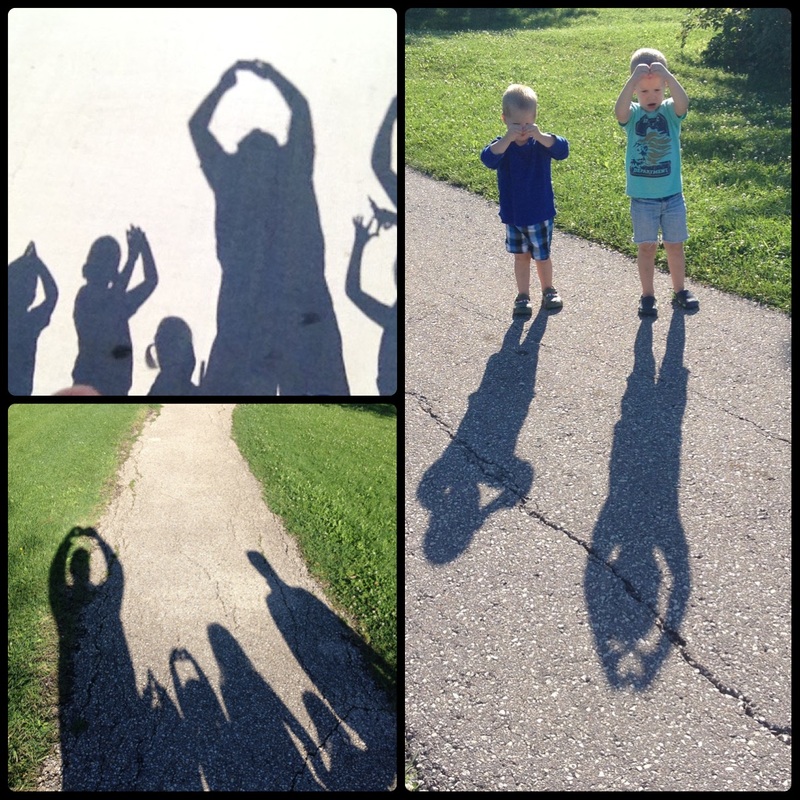 Both littles appreciated the focused one-on-one art times. 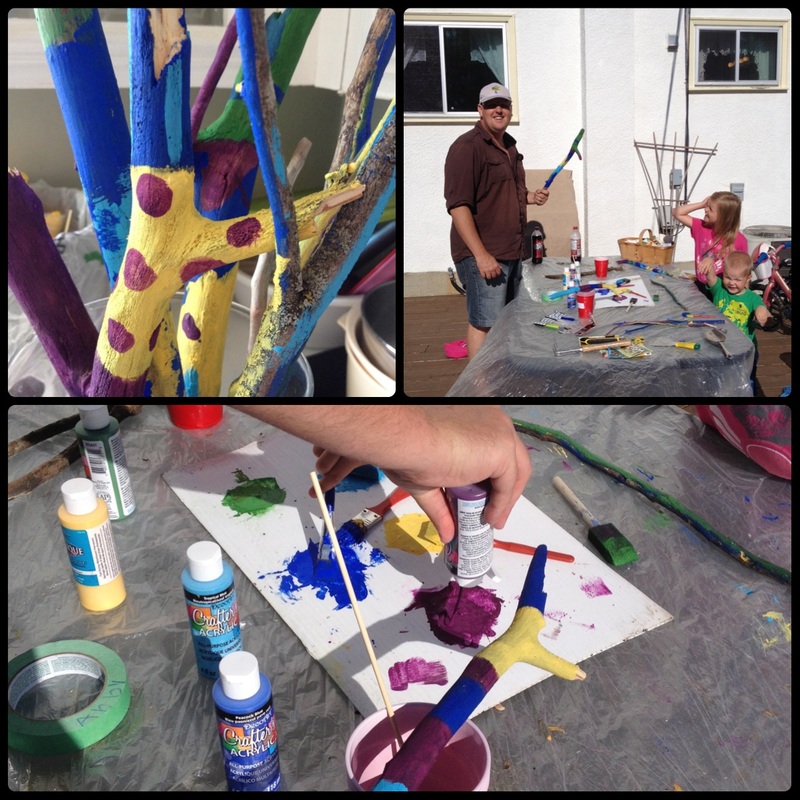 Some art projects require no mess at all! 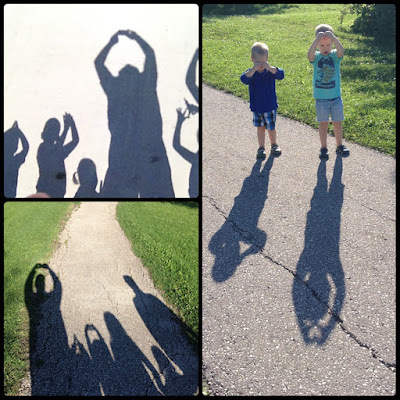 Shadow play was something we all had fun with this summer. This wasn't exactly a family craft project, but we all certainly benefit from the result! 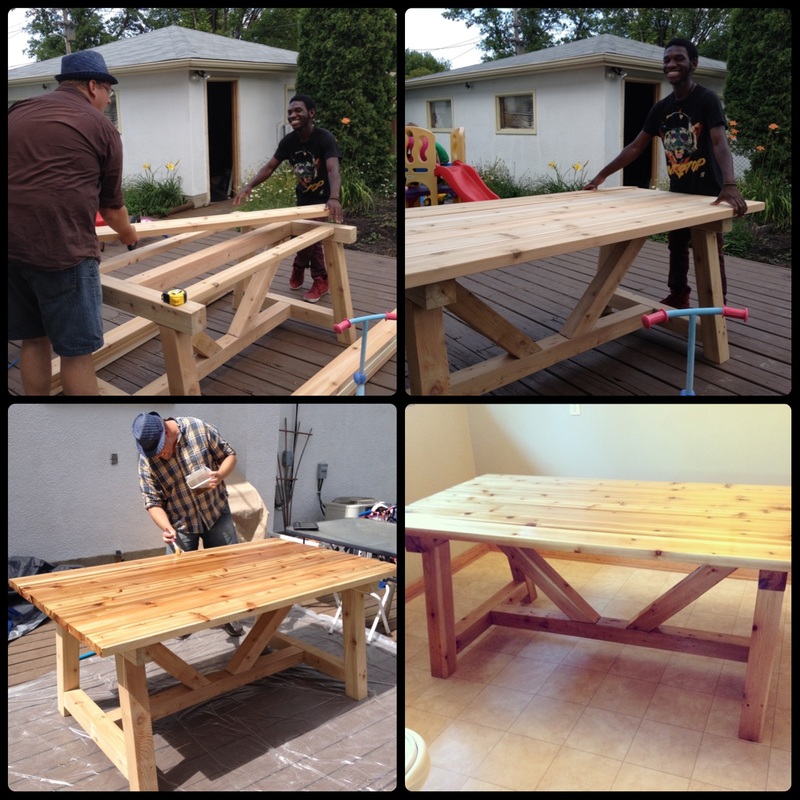 My favourite art project of the summer, was definitely my table! 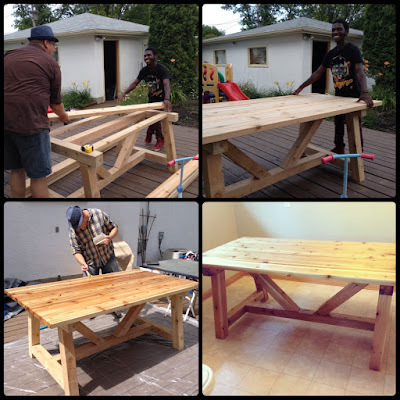 David, with some help from a student he mentors, built me this gorgeous kitchen table. My David's love for me is all over this table and I'm so thankful! Great blog! Sounds like a great summer!